Burratta is a a fresh Italian cheese, made from mozzarella and cream The outer shell is solid mozzarella while the inside contains both mozzarella and cream, giving it a creamy, soft texture. It is usually served fresh, at room temperature. The word "burrata" means "buttered" in Italian. Mostarda is a is an Italian condiment made of candied fruit and a mustard flavored syrup. At Little Doms, it was roasted tomatoes, onion slivers, honey, and ground mustard. It tasted a lot like ketchup and mustard mixed together. Speck...think prosciutto ham but a lot less funky. The Beef: Little Doms used pre-ground, 80:20 Chuck. The beef was remarkably beefy and juicy. It was wholly lacking in any funk from aging or mineral/blood flavors. The claim was the beef was dry-aged, but none of those flavors came through. The patty weighed in at about 7 ounces. The beef was tender and not watery, so it was safe to assume that it was freshly ground. The Seasoning: The exterior was lightly salted, and there was no seasoning apparent in the blend. The Sear: The sear imparted by the wood-fired grill was EPIC. 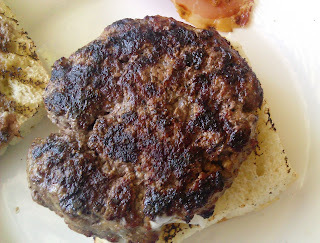 I would have guessed that the burger had been griddled or pan seared based on the even and deep nature of the sear, but a hot grill with wide grates can work Maillard magic. The sear added a little char and a lot of crunchy texture to the dish. The Preparation: Little Doms delivered a cheeseburger cooked to Medium as I requested. The beef was not over-manipulated in the patty forming process, so it was a firm but tender bite. The 7 ounce patty was quite thick--around 2/3 inches. The Cheese: Dull...the Burratta was mild and creamy. 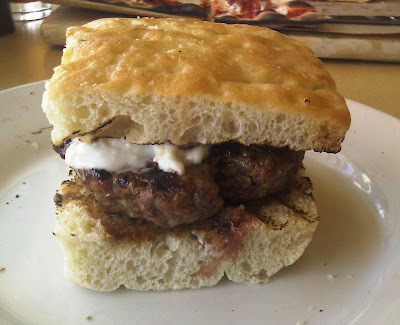 It was completely lost in the overly thick fociacca bread and the firm beef. It lent nothing to the bite. 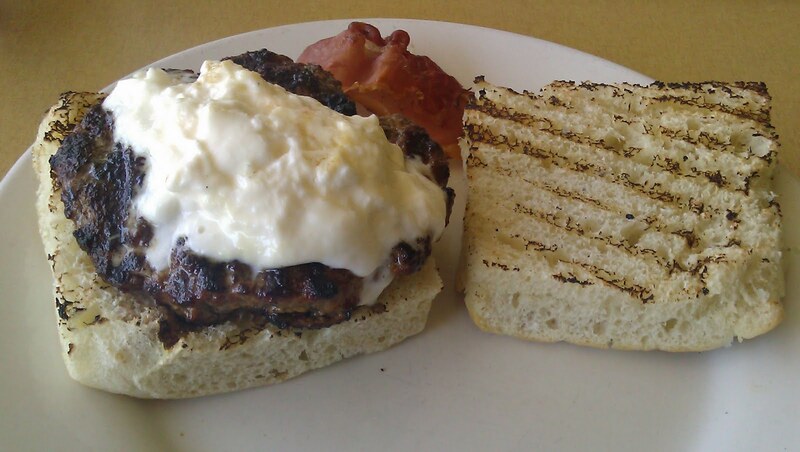 Fresh mozzarella never makes sense on a burger. The Bun: The bun/focaccia was baked in-house. Little Doms gets all of their other breads from BreadBar. 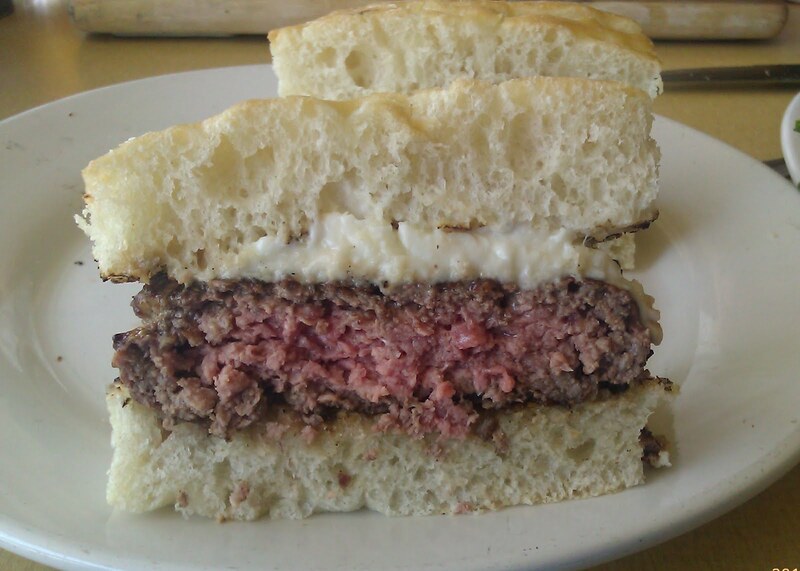 Sadly, BreadBar makes the best damn burger bun in Los Angeles, but Little Doms chose the burger as the dish for a non-BreadBar product. The focaccia, on its own, was great. It was thick, springy, relatively moist, and yeasty. However, when wrapped around the burger, it created a dry and spongy mouth feel. At first I removed the bottom bun to improve the quality of the dish. This was a half measure, and it produced an average result. 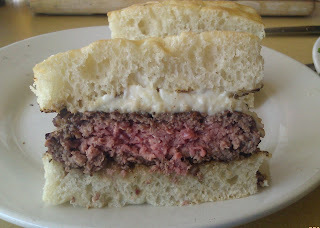 The second half of the burger was consumed with no bread so that I could savor the beef. The Meat To Bun Ratio: The bun/focaccia bread dominated the beef to the point of nearly ruining the dish. The Fries: None--Little Doms served fried potatoes in lieu of french fries, and I am not a fan of fried potatoes. The Toppings: The crispy, thinly shaved Speck was terrific. It was like prosciutto with none of the funk that can develop when it is cooked. The Mostarda was a tasty sauce for dipping all of that excess focaccia. The Value: This was 12 buck, pre-ground Chuck. The value was weak considering that this was Chuck and that the dish was nearly inedible as delivered by the kitchen. Burger Review : The Little Doms interpretation of the cheeseburger flew wide of the mark for the most part.